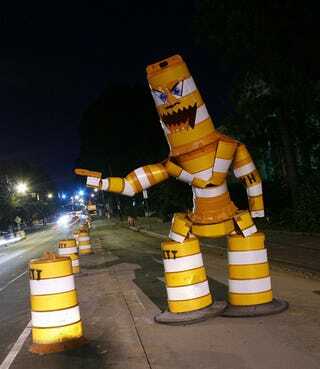 NC State student Joseph Carnevale, the vigilante artist behind the traffic barrel monster, has been sentenced to 50 hours of community service because of his "crime." Perhaps, as a community service, he should make more. The judge in the case deferred judgment which means, if he completes his community service, the charged against Carnevale will be dismissed. Hamlin Associates, the company who owns the construction barrels, did not press charges and actually want their own version of the statue stating "If we'd known he'd do that good of work, we'd have given him the barrels."